We mostly perform in the Harrisburg, York & Lancaster PA area. Most of the venues in this area allow for the enhancement of lighting. However, proper lighting for an event is both a science and an art. It requires both good observation and an eye for design. Just like landscaping can greatly enhance the visual appeal and value of land, lighting can enhance the ambiance of any event. In this particular video you are able to see three of our popular services. The first, and arguably the most noticeable, would be the Intelligent Lighting. Intelligent Lights are the four moving fixtures you see on top of the truss totems. 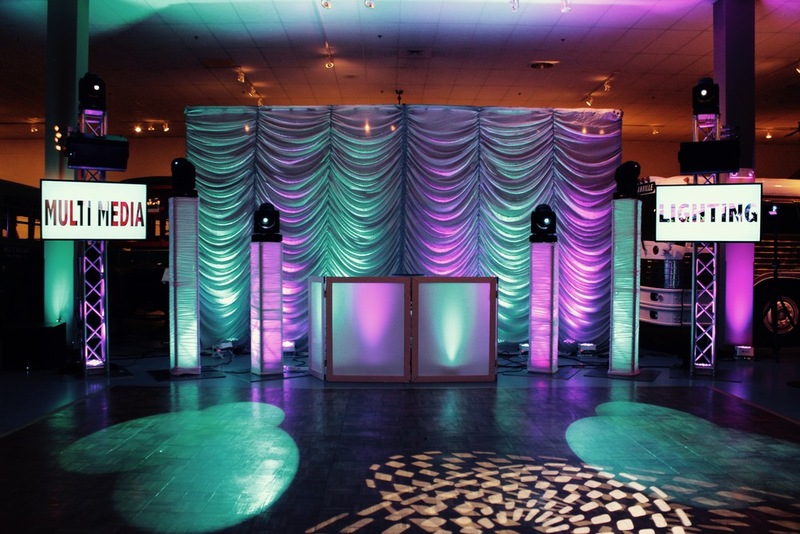 These lights can be used for a variety of options from spotlights during introductions and the first dance, to an assortment of rich colors and moving gobo patterns to liven up the dance floor. This is undoubtedly one of the best light fixtures to have on your wedding day, and is sure to add a little extra enticement for your guests to get on the dance floor! Behind the lighting fixtures you will see our custom Austrian drapery. This drapery, when lit, can contain multiple colors (of your choice) to create a breathtaking backdrop for your sweetheart, or head table. The up lighting that we are using to enhance the drapery is controlled with the same technology as the intelligent lighting. This allows us to create a seamless light show that will make the entire room come to life.